Dust, which is any airborne finely divided solid or liquid material with a diameter of less than 100 μm, can exacerbate existing respiratory problems and other health issues and even damage a person’s lung tissue when inhaled. Moreover, dust can impair people’s visibility which can be very dangerous in an industrial setting. To limit the risk of dust in industrial environments, effective measures must be taken. To do this, the number of particles in the air must be measured. PCE Instruments offers various devices to do so. The best-selling device in the product category “particle counters” is the PCE-PCO 1. Its popularity on an international level might be due to its highly competitive price, but the fact that it is PCE-branded certainly plays a major role as PCE Instruments has become an increasingly well-known brand on the European market for measurement and test equipment. The PCE-PCO 1 can be used to measure, for example, respirable crystalline silica dust (RCS), soot particles, e. g. from exhausts, agricultural dust, wood dust, metal dust, carbonaceous dust, chemical dust, plastic dust, etc. The particle counter is frequently used to monitor clean rooms or the indoor air quality in industrial or office environments. It measures 6 different particle sizes: 0.3 µm, 0.5 µm, 1.0 µm, 2.5 µm, 5.0 µm and 10 µm. The measured values can be easily read out from the large LCD colour display with backlight. It can record images and videos and is equipped with air temperature and relative humidity sensors. The internal memory of the dust measuring device has a capacity of 80 MB but if more data need to be saved, a MicroSD card of up to 8 GB can be inserted. 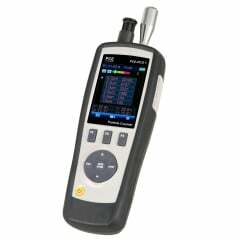 The PCE-PCO 1 comes with a zero filter, a rechargeable battery and charger, a USB cable, a software for further analysis of the data, a mini tripod, a factory calibration certificate and a user manual. The complete package comes in a handy carrying case. PCE Instruments, with headquarters in Germany and offices around the world, such as the UK and the US, manufactures and sells test instruments, control systems, laboratory and weighing equipment for a vast range of different purposes and applications, to a great extent under the label "PCE Instruments ®", but also from other renowned producers. PCE also provides pre- and aftersales technical advice as well as calibration and re-calibration services.